When Milwaukee first announced their entry into the OPE market, we had two questions – where’s the chainsaw and will we get a mower? The Milwaukee M18 Fuel Chainsaw is here and boasting some impressive power. The product team tells us they’re exceeding 40cc gas performance out of it. A major talking point for the Milwaukee M18 Fuel Chainsaw is the power source – a High Output 12.0 Ah battery. This pack has 216 watt-hours in it, which is the equivalent of two 6.0 Ah packs or three 4.0 amp hour packs. 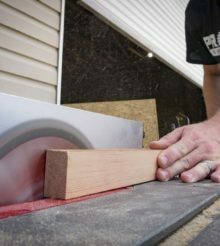 In internal testing, Milwaukee tells us they get 150 cuts in 6 x 6 cedar. Of course, every species is different and you never get a perfectly consistent branch to cut, but that still gives us an idea of how much cutting you can get. Tim Johnson from our OPE Reviews site did some runtime testing and got 100 cuts in 6-inch oak with 2 bars left on the battery. Perhaps more impressively, he put it head to head against Husqvarna’s popular 460 Rancher to see how it compares in cutting speed to our baseline saw. Spoiler alert: Milwaukee was faster. You can check out Tim’s article below or head over to YouTube to watch the video review directly. Clearly, Milwaukee’s pricing is right in line with the other major power tool manufacturers. EGO comes in quite a bit less, but there’s a caveat: according to EGO, it’s technically a homeowner model. We’ll have to wait and see what EGO’s commercial pricing and performance looks like before it’s in direct competition with these other models. The battery description is decent, appreciate that two 6ah packs and 3 4ah packs, but how many 2ah packs is it? How does it stack up against the Echo 58V? Trying to decide between the Echo and Milwaukee! I already have the 58V string trimmer and 4ah battery, but the rest of my tools are M18.